As spring semester draws to a close, the choral season does as well. 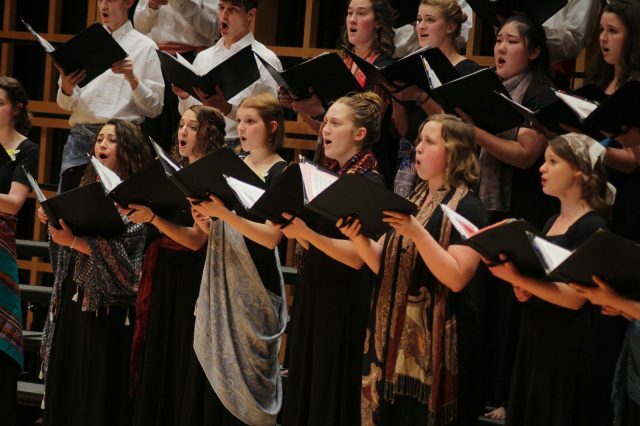 Goshen choirs will join in Sauder Concert Hall to perform one last show for the 2018-2019 season this Saturday, April 6 at 7:30 p.m..
Earthtones is an annual performance put on by all of the Goshen College choirs which celebrates the culture and diversity of the world. The choirs will perform pieces from numerous countries, sung in languages such as Swahili, French, Sami and Hindi, as well as in English. Some songs don’t include words at all, but rather voices mimicking percussive sounds. Voices of the Earth, formally Women’s World Choir, and Men’s Chorus will also come together to sing a piece called, “Woyaya,” an annual tradition to send off graduating Goshen College seniors who are members of the choirs. As also is tradition, senior music education majors will be conducting a piece of their choosing for their ensembles. Anne Buckwalter will be directing Voices of the Earth in a piece entitled “Canto Viaje,” a tune inspired by the Shipibo people she spent time with in Peru while on Study-Service Term. Voices of the Earth will also perform one song with female and non-binary guests, including mothers, sisters and friends, among others. This tradition, which has been given the name “mother of all choirs,” honors the female and non-binary mentors who have helped guide the members of the choir through life. This year’s piece is called “I Live and Breath.” Sophomore Mandy Morrison said that this tradition is one of her favorite parts of the show. Debra Detwiler, director of Voices of the Earth and former director of Chamber Choir, will be retiring after this year. Detwiler has been at Goshen College since 1999 and established the Women’s World Music Choir in 2004. Detwiler was drawn to Goshen College by the energy of the students. While she will no longer be teaching classes, Detwiler will continue conducting Voices of the Earth. The Men’s Chorus, directed by Joshua Boggs, will sing a Gaelic song called “Seinn O,” as well as a couple songs from other traditions, including “Sivela KwaZulu,” a piece from South Africa. Chamber Choir, also directed by Joshua Boggs, who took over the position from Detwiler this semester, will perform several pieces, including “Baba Yetu,” a South African song that will utilize drums and soloists. Audience members may recognize the piece — Parables performed it in their 2017-2018 lineup. The choirs have been preparing for the show since January. Whether you’ve been to every show the choirs have put on, or no show at all, Earthtones is a chance to come together and celebrate the world’s colorful cultures through music. Tickets are $10 for adults and $7 for students and seniors. Goshen College students can attend free with a student ID. There’s no better way to close the year for Goshen College students than to go out singing and dancing.